eCite - Is problem solving teachable? The development of the discipline of mathematics through its long history has been characterized by solving problems. Currently, many contemporary curricula place problem solving as a central feature of school mathematics learning, and indicate that the capacity to put mathematics to use in routine and novel situations is a vital outcome of schooling. However, such documents rarely indicate how to teach problem solving, but seem to assume that it is possible to do so. This raises the important question: Is problem solving teachable? 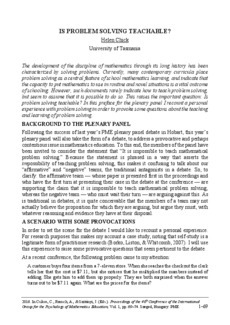 In this preface for the plenary panel I recount a personal experience with problem solving in order to provoke some questions about the teaching and learning of problem solving.